Dacia Sandero engine oil capacity in quarts – liters. From year: 2008, 2009, 2010, 2011, 2012, 2013, 2014. How many quarts / liters of engine oil is needed for an oil change including replacement of oil filter for a Dacia Sandero. If you want to do maintenance by yourself on your Dacia, if you want to change your engine oil and filters see and you don’t now how big it’s your engine volume or how much quarts / liters oil enter in your car engine below you can see what is your car engine oil capacity and what type of oil you must use. Dacia Sandero 1.2 16V, engine oil capacity in quarts / liters. Dacia Sandero with engine 1.2 l, it is a cargo cars. Dacia Sandero engine code: D4F. Engine capacity: 1149 ccm (69,76 cubic inches). Dacia Sandero engine oil capacity liters: 4 l.
Dacia Sandero manual gearbox oil capacity. Dacia Sandero automatic gearbox oil capacity. 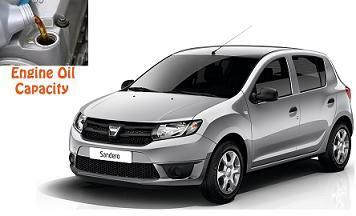 Dacia Sandero recommended engine oil: A.Z. Meis MT 7 5w-40, Castrol 5w-40 Magnatec, Mobil 1 Super 2000, Mobil 1 Super 3000, Liqyu Moly Toptec 4100 5w-40, Liqyu Moly Toptec 4200 5w-30. Dacia Sandero 1.4 MPi, engine oil capacity in quarts / liters. Dacia Sandero with engine 1.4 l, it is a cargo cars. Dacia Sandero engine code: K7J 710. Engine capacity: 1390 ccm (84,40 cubic inches). Dacia Sandero engine oil capacity liters: 3.3 l.
Dacia Sandero manual gearbox oil capacity: 3.1 l.
Dacia Sandero 1.5 dCi, engine oil capacity in quarts / liters. Dacia Sandero with engine 1.5 l, it is a cargo cars. Dacia Sandero engine code: K9K 790/792, K9K 796, K9K 892. Engine capacity: 1461 ccm (88,70 cubic inches). Dacia Sandero engine oil capacity liters: 4.5 l.
Dacia Sandero manual gearbox oil capacity: 2.8 l.
Dacia Sandero recommended engine oil: A.Z. Meist MT-7D 5w-40, Castrol 10w-40 Magnatec Diesel, Castrol 5w-40 Magnatec Diesel, Liqyu Moly Leichtlauf Diesel 10w-40, Diesel, Mobil 1 Super 2000 X1 Diesel 10w-40, Mobil 1 Super 3000 XE Diesel 5w-30. Dacia Sandero 1.6 MPi, engine oil capacity in quarts / liters. Dacia Sandero with engine 1.6 l, it is a cargo cars. Dacia Sandero engine code: K7M710. Engine capacity: 1598 ccm (97,02 cubic inches). All information about engine oil capacity or gear box oil capacity is taken from Dacia Sandero owners manual. Hear you can find the steps how can you reset Dacia service light after you change the engine oil. Hear you can find the fuel consumption in liters or gallons for a Dacia.